A week ago I was puzzled by the work at the eastern end of the superstructure. Testa was placing the vertical channels and welding angle irons. Well here, it seems they were making what I would call a tiedown - brackets that bind the bridge girder structure to the concrete pier. As the concrete roadway is removed the entire bridge structure loses weight - sort of a Testa-diet. The tendancy, then, is for the concrete support to rise - since for all the time since the bridge was built the concrete support has had the weight of the bridge on it. So, if enough weight is removed from the bridge, all the stresses will be concentrated in the two coupling pins. 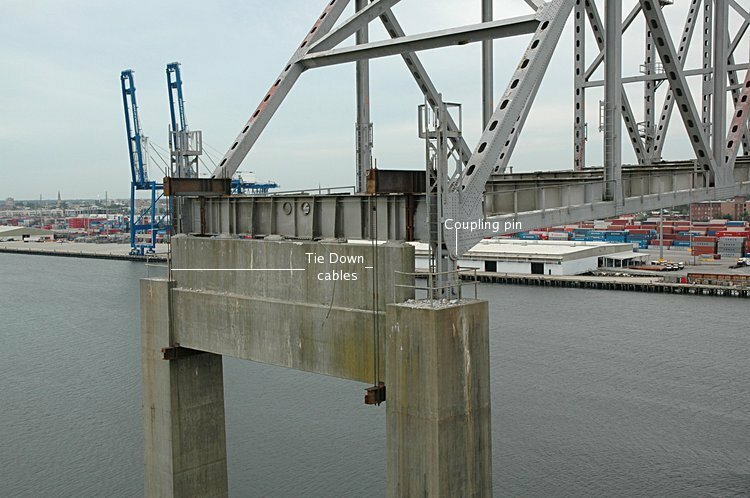 To assist the bridges integrity, the steel superstructure is couple via the tiedown cables (see the beam that link the short beam resting on top of the transverse girder (on either side) with a similar beam under the concrete cross member.